(Open from 12 PM to 6 PM, Tuesday through Friday. For the 3rd year in a row, DiverseArts' Fresh Black Paint presents an opportunity for audiences of all backgrounds to experience the voice of contemporary African-American visual artists. Featuring Austin artists- John Fisher, Harve Franks, and Rejina Thomas, the show spans a broad range of technique from realism to abstraction. 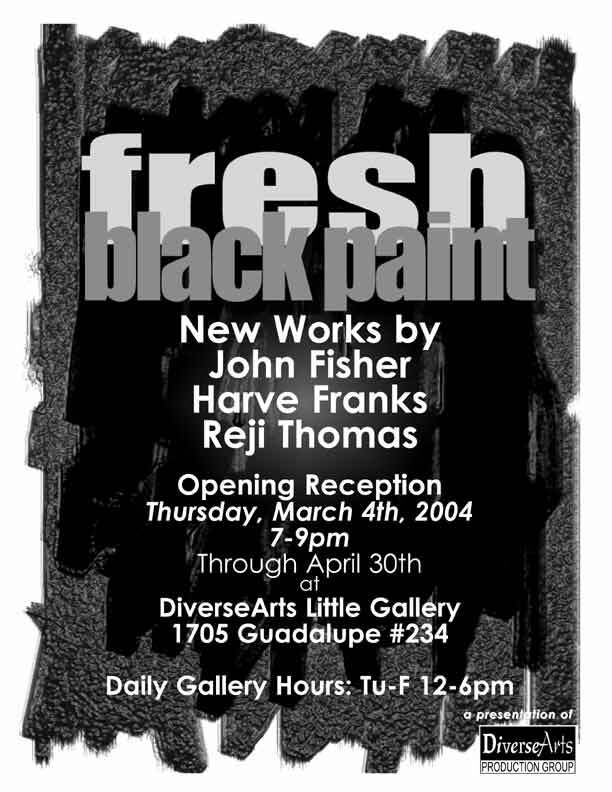 Traditionally, one of Austin's most unique observances of African-American Heritage Month, Fresh Black Paint returns in March 2004 proclaiming the importance of observing African American heritage 365 days a year. Join us for an eye-opening Artists reception on Thursday, April 1st from 7-9pm. The nostalgic innocence and honesty expressed in John Fisher¹s Good Times plays nicely off the more pensive look of his Woman in Contemplation . Together the two set a gentle introspective tone for the more expressionist portraits by Harve Franks. In stark contrast are the bold and explosive abstract paintings by Rejina Thomas. Together these three artists create a stunning visual feast! For more information contact Harold McMillan or Jodie Keeling at 477-9438 or info@diversearts.org. John Fisher is a native Austinite who has been painting and drawing since childhood. After beginning his involvement in visual art in junior high school, his study deepened as a student at East Austin¹s LC Anderson High School. John went on to complete a degree in art and education at Texas Southern University in Houston, where he studied with renowned painter John Biggers. After a Ford Foundation funded Residency Fellowship in Ivory Coast, John returned to live in Austin. Over the past 25 years he has participated in a number of group exhibits, was commissioned to paint a massive mural at the Carver Library, and was commissioned by DiverseArts to design the official images for two previous Clarksville Jazz Festivals and the Austin Jazz and Arts Festivals. This is John Fishers first Fresh Black Paint exhibit. Rejina Thomas is a multifaceted visual artist and craftsperson who is best known for her commissioned glass work produced through her Graphic Glass Studios. An Austin resident for over 20 years, Rejina¹s work spans the range from functional furniture, to architectural embellishment pieces, glass trophies, and plaques, paintings on canvas and glass and much more. She is a master craftsperson who uses glass and stone etching, and blasting, welding, engraving, hot glass casting and a number of other techniques to achieve stunning results in her commercial and fine art. Rejina¹s work is installed and in collections world-wide‹The Texas State Capitol Building, official gifts to the Queen of England, Sister City gifts from Austin to Adelaide, Australia and Iwata Japan‹and in numerous private collections throughout the United States. Ms Thomas was commissioned by DiverseArts as the official artists for the first Clarksville Jazz and Arts Festival in 1989. Recently she has completed a series of large scale oil and acrylic abstracts on canvas and wood. This is Rejina¹s first exhibit in the Fresh Black Paint series.